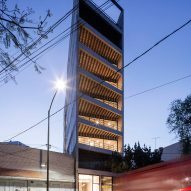 Each apartment in this narrow concrete and glass block in Mexico City features a full-width balcony lined with sliding glass doors. 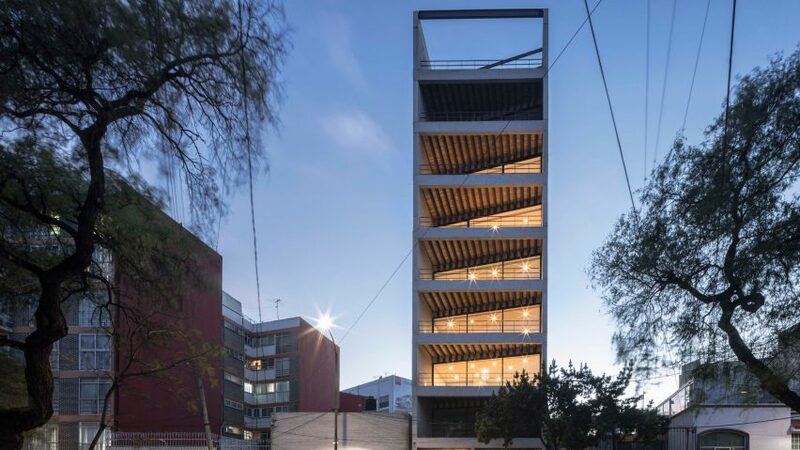 The Rodin 33 building was designed by local architect Carlos Marín and takes its name from the street on which it is located in the Mexican capital. A narrow plot dictated the dimensions of the apartment tower, which is 7.8 metres wide and 28 meters in length. The nine-storey building accommodates individual residences on each level, with a penthouse spread across the top two floors. A lobby occupies the ground floor and a garage is located in the basement. The building's facade comprises a simple concrete frame divided into equal layers. The facade follows the line of the pavement, which is at an angle to the building's main axis. The frontages of the apartments are set back from the facade to create angular balconies that provide extensive views of the city skyline. Sliding doors that extend the entire width of the open-plan lounge, kitchen and dining area can be retracted to alter how much the interior is connected to the outdoor terrace. "The facade is moulded by a 20-square-metre terrace that is contained within a concrete frame structure," said the architects. "This semi-open terrace allows the user to transform the space in a hybrid condition between interior and exterior." A pair of voids carved into the building's concrete elevations ensure natural light reaches areas at both ends of each apartment. Corridors lined with windows that overlook courtyards at the base of these voids connect the public areas at the front of the residences to the private bedrooms at the rear. The apartments are accessed from a lift and staircase in the lobby, which features details including plants and marble surfaces that soften the otherwise austere material palette of concrete, steel and glass. A circular light fitting is suspended from the lobby ceiling that features timber inserts. 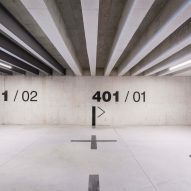 Ten foundation piles that reach down 18 metres into the ground support the building's structure, along with the parallel reinforced concrete walls. Between the lateral wall, a series of beams support the floor plates of each apartment. These are left exposed in the basement garage, turning the construction technique into a decorative feature.